So I made some crab mac and cheese. Well I guess it's not technically macaroni, so rotini and cheese. Using beer adds a nice depth to macaroni and cheese, and Monk In The Trunk Organic Amber Ale was perfect for it. Not too light, not too strong, and it really enhanced the flavors of the cheese. Sipping the beer alongside the dish made for a delicious pairing. Here is my recipe. Cook the pasta as you normally would. Melt one tablespoon of butter in a saucepan and add the chopped onion and garlic. Cook over medium heat for 5 minutes. Add the milk and beer. Slowly add in the cheese while stirring. Whisk in the flour and season with salt. Remove from heat and add the cheese mixture and crab meat to the pasta. Place in a baking dish or ramekins. Combine the rest of the butter with the bread crumbs and coat the top of the pasta. Bake in a 400 degree oven until the top is golden brown. Pair the dish with Monk in the Trunk. I got the idea to make a balsamic reduction with a beer. I decided a stout would work best so I went with Dogfish Head Chicory Stout. Reducing the beer and vinegar brings out their sweetness and results in an interesting concentrated flavor. I used more beer in the ratio so that those flavors would come out more. I wasn't really sure if all this would go with tuna tartare but that was my plan so I went for it anyway. Surprisingly, the sauce actually seemed like it was made for the tuna, which I guess it really was. It's also worth mentioning that I paired my tuna tartare before with Jai Alai White Oak IPA. That was a great pairing because the piney notes of the beer really complemented the dish. So if I were to do a beer dinner (which I'm thinking of doing at my house at the beginning of January) I would probably make this dish with a stout, pair it with an IPA and then save the stout to pair with a later dish. For the reduction, bring the balsamic vinegar and beer to a boil. Make sure you are using a large enough pot because it bubbles up a lot from the carbonation in the beer. Once it boils, reduce the heat and let it cook until syrupy. Combine the rest of the ingredients (except the bread obviously) and drizzle with the reduction. Serve with the toasted bread. Super easy right? 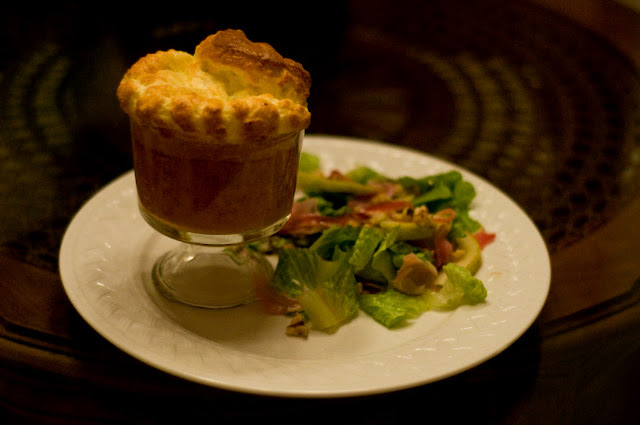 This was my first attempt at a savory souffle. I made a blue cheese souffle and cooked some pears in Victory Moonglow Weizenbock for a sauce. I also made a prosciutto salad to go with it and then paired all that with Ayinger Weizenbock. Victory Moonglow is fruity and spicy and perfect for cooking the pears in. Kinda similar to Schneider Aventinus that I used a while ago to cook apples. So the pears and beer were cooked down with some brown sugar and then pureed. The sauce came out delicious. Unfortunately, it's not in my picture since I tried to take one quickly before the souffle deflated. But trust me it was really good. When I do another beer dinner I definitely want to incorporate this sauce somehow. Anyway, it was a really nice contrast to the blue cheese and the saltier flavors of the souffle and salad. Although blue cheese is a strong flavor, the souffle is still a subtle dish so I felt that pairing it with the same beer that the pears were cooked in would overpower it. Ayinger Weizenbock was the perfect pairing, and dude that is one delicious beer. Look how pretty! I had some Ommegang Abbey Ale left over from my two beer pumpkin soup so I used it in my crab soup. So nummy. From what I remember: crab, onions, tomato paste, butter, garlic, beer, evaporated milk, parsley, salt. Can you tell I've gotten lazy with writing down recipes? Good stuff though, and dubbels are really versatile with cooking. They work in both sweet and savory recipes and always add something special. I carved some pumpkins yesterday and then roasted the seeds and made a pumpkin soup. I decided to use two beers in the soup - A pumpkin ale (Shipyard Pumpkinhead) to highlight the pumpkin flavor and a dubbel (Ommegang Abbey Ale) for it's sweeter caramel and fruit notes. Place the chopped pumpkin in a large pot and cover with water. Bring water to a boil and cook until tender. Puree the pumpkin in a blender and return to the pot. Over medium heat add the rest of the ingredients. 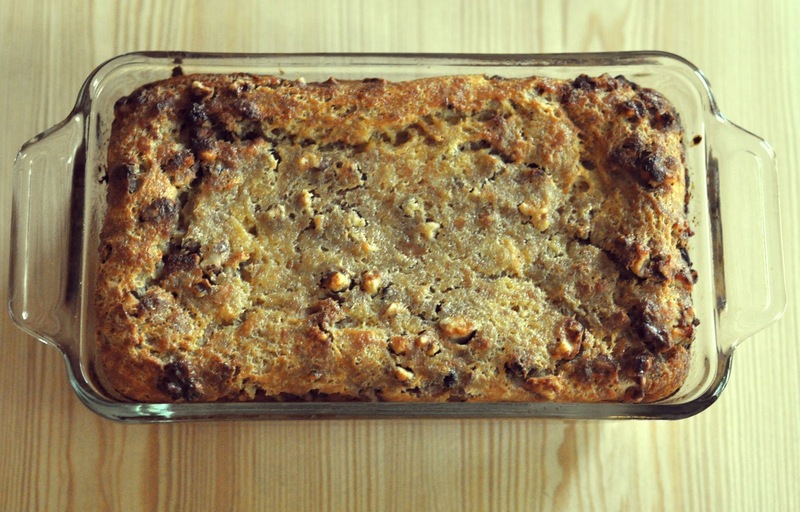 Top with roasted pumpkin seeds. For my pumpkin seeds I covered them in a mixture of melted butter, salt, garlic powder, cinnamon, and paprika before roasting for 45 minutes. So I guess I lied when I said I was gonna be posting stuff more often. Oh well. I had this really tasty dish a few weeks ago and never got around to sharing it, so I thought I would now. I roasted some lamb shoulder chops with Cigar City Maduro Brown Ale. Cigar City is an awesome brewery from Tampa which has some really interesting beers. I love visiting them whenever I get a chance. 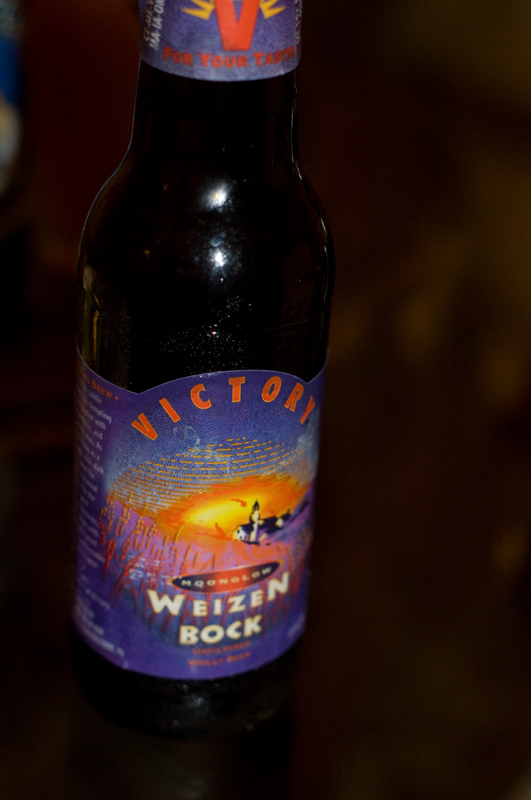 This beer is a great brown ale which also happens to work beautifully for cooking. The distinct flavor of lamb in my dish worked really well with the beer's rich flavors. Also, I think one of my new favorite pairings is Maduro with sweet potatoes (specifically, buttery, creamy, sugary, mashed sweet potatoes). So good! I've always been against calling anything "ceviche" other than the traditional Peruvian version. Just lime juice, salt, fish, onion, aji amarillo, cilantro, sweet potato, and probably some corn. That's really the best kind and the way it should be. But this way of "cooking" meat is really cool. And delicious. And maybe we shouldn't be limited to only preparing it one way. So I decided to experiment just a little bit... using beer of course. 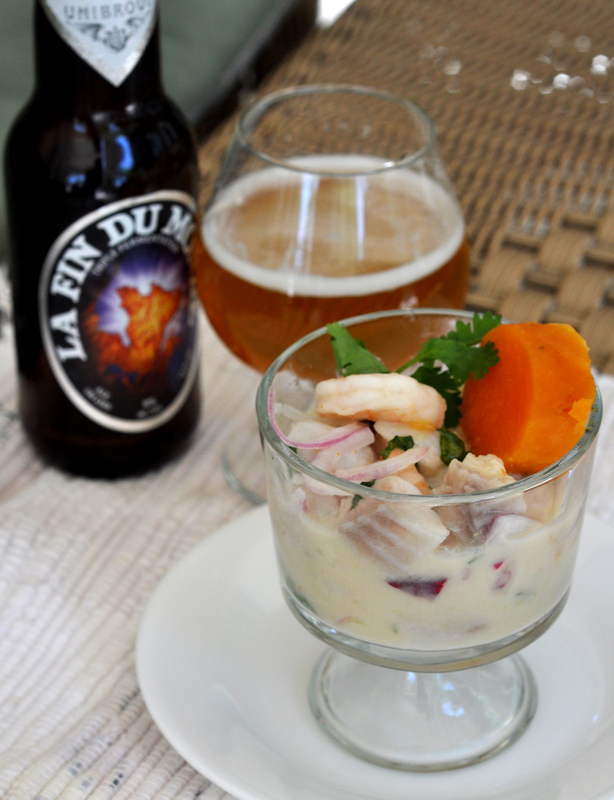 Beer dinners often include ceviche paired with beers, but never with the beer in it. So I gave it a shot. 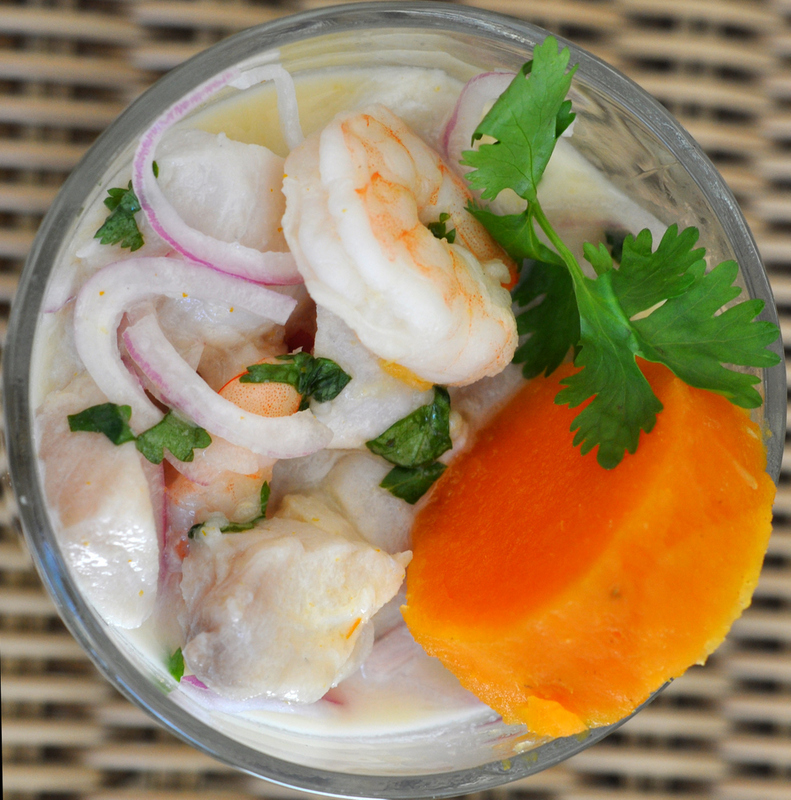 I made a whole batch of ceviche the normal way and just reserved 1/4 of the fish to experiment with. I was making food for my family and didn't want them to be a bit disappointed if I tampered with their delicious ceviche. So for my portion, along with the lime juice, I added coconut milk and a little bit of Unibroue's La Fin Du Monde (which was left over from the multiples cooking class). It worked just as I had hoped for. Somehow the beer and coconut flavors were so well matched, it's like they were meant to be used together. La Fin Du Monde's citrusy, yeasty flavors and the subtle sweetness of the coconut milk balanced the dish beautifully. And of course pairing it with the beer resulted in perfect harmony. I also included some shrimp and added the traditional sweet potato which still worked amazingly, especially with the hints of coconut. Maybe I'm just crazy since no one else except me got to try the dish, but I thought it was delicious. I'll have to experiment again on a bigger scale and get a second opinion. 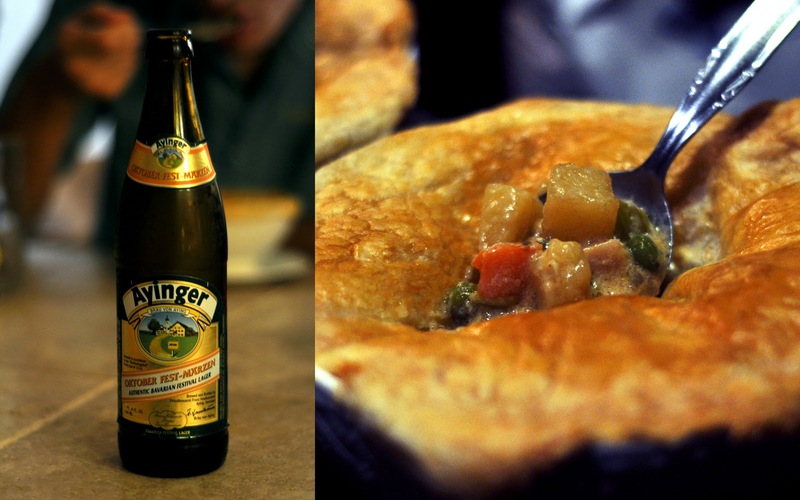 I made another beer chicken pot pie this week and wrote down the recipe for it. 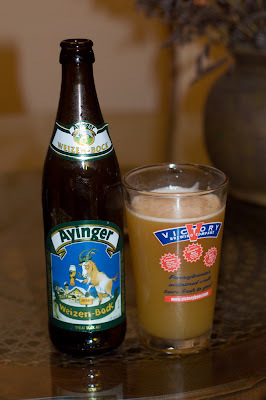 This time I used Ayinger Oktober Fest-Märzen. I chose this beer because I thought the bready malts and sweet caramel notes would give a nice touch to a chicken pot pie and complement the crust. Very yummy result. Melt two tablespoons of butter in a large pot. Add the onions, celery, mushrooms, and chicken breast, cooking over medium high heat. Season with half a teaspoon of salt and a pinch of black pepper. Once the chicken is browned on all sides, remove it and set aside. Add the milk, 1 cup of the beer, potatoes, carrots, and peas. As the vegetables are cooking, add the garlic powder, chicken bouillon, thyme, and the rest of the butter and salt. Once the potatoes are cooked through, turn off the heat. Add the last 1/2 cup of beer. Dissolve the flour in a small amount of water and stir into the pot to thicken the mixture. Add the chicken back to the pot and place the mixture into 4 oven safe bowls. Cut the puff pastry into pieces big enough to cover each bowl. Beat the egg with a little bit of water and brush onto the sides of the bowl. Cover each bowl with the pastry sheets, pressing down on the sides to seal. Make a small slit on the top of each pie and brush with some of the egg wash. Bake in a 350 degree oven until the pastry is golden brown. I've really been slacking on making stuff for the blog lately. I have a lot fewer posts this month than usual. I suppose it's partly because I started a new job and was more concerned with that. But I want to get back on top of it and try to make at least one beer related meal a week. I also want to work on getting nicer pictures of my food. So let's see how well I stick to that. So I had a cooking class the other day for some friends. These friends happen to be triplets and I also happen to have a twin sister, so we made it a "multiples cooking class." With beer of course. I met Peasha (aka Patricia) when we both worked as servers at a Japanese Restaurant. We found out we had a lot in common: We're both from Latin families (I'm Peruvian, she's Cuban), we both majored in Psychology, and we're both multiples. I'm an identical twin and she's a triplet. Both of us work at FAU now and sometimes get to have lunch together. A few weeks ago when hanging out with Peasha and her sisters, Cristina and Elena, they mentioned that they wanted to learn to cook. So we decided to have a cooking class where I would teach them my style of cooking. So I set aside Wednesday, the 15th at 8:00 pm to have a cooking class with the triplets and my sister. The menu was: stuffed mushrooms, fish tacos, lamb chops with roasted thyme potatoes, and chocolate souffle. I brought a four pack of La Fin Du Monde (Peasha's favorite beer) and some other beers to cook and pair with, including: Ommegang Abbey Ale, Rogue Chocolate Stout, and White Rascal. Even though they wanted to learn basic things, I chose some food items that people might not make on a regular basis because the same techniques can apply to more everyday foods. All the courses turned out delicious and Patricia, Elena, and Cristina were the best students anyone could ask for. Four days later Peasha told me that they had already made the stuffed mushrooms twice and that Cristina made steak and pork the way I taught them. They were really serious about learning! Here's a recap of the evening, although I didn't get many pictures of the final products. You can see my recipe here. Fish tacos were chosen so we could try some beer battering which could also be applied to other dishes, such as fish and chips or onion rings or anything really. We used White Rascal for the battering. Elena whisked together the batter, Peasha coated the fish, and Cristina did the frying and flipping. Throw that crunchy fish on a tortilla with some pineapple salsa, lime mayonnaise, and lettuce and dinner's ready. Here's the basic recipe. Peasha coating the fish in batter. Lamb chops were my choice for the entree because they are freaking delicious and if I could show them the basic techniques for that, they could apply it to steak and other meats. Before the dinner I was contemplating between salmon, roasted chicken, steak, or lamb as the main course. In the end I chose lamb but I wasn't sure what I was going to do with it, so I made it up as we went along. We seasoned the chops with salt, pepper, and fresh mint and seared them with some onions and garlic. Once the they were done we removed them and I made a sauce by deglazing the pan with Ommegang Abbey Ale (getting all the delicious flavor up from the bottom of the pan) and adding butter, milk, and some other seasonings. This may have been the biggest success of the night. Helping Peasha with her knife skills. These are super easy to make. You just wash and chop up a few potatoes and arrange them on a baking sheet. Add olive oil, garlic powder, salt, and thyme. Bake at 400 degrees for an hour and you've got a really tasty side dish. Potatoes before going in the oven. Everyone helping with the thyme. Chocolate souffle for dessert because of how surprisingly easy yet delicious it is. Well I guess it wasn't dessert since we ate it before the lamb and potatoes. But we are adults now and can choose whatever order we want to eat our dishes in :) We made a chocolate sauce to put on top with melted chocolate chips, milk, butter, and sugar. We paired the souffle with Rogue Chocolate Stout. And we left one of the souffles uncooked to chill in the fridge. That makes some yummy chocolate mousse. Whipping up some egg whites. I had so much fun. I can't wait to do something like this again! Thanks to Peasha, Cristina, Elena, and Valeria. And my mommy who was there too. And Brian even though he only woke up when the food was ready. You're all awesome! Damn. How has it already been three weeks since my last post? I've been slacking. But there will definitely be more recipes going up in the next few weeks. (I gotta try some stuff with pumpkin beers!) For now, here's the recipe for the Creme Brulee ice cream from my last post. Bring the heavy cream and half and half to a simmer in a medium saucepan. Whisk the egg yolks, gradually adding the sugar. Continue whisking until the egg yolks are pale yellow. Pour about half of the hot cream slowly into the egg mixture, whisking constantly. Pour the egg and cream mixture back into the saucepan and cook over medium low heat until it starts to thicken. Remove from heat and add the rest of the ingredients. Refrigerate for a few hours and then pour into an ice cream maker. The name says it all. Another beer from Southern Tier that tastes like a decadent dessert. Just the smell of it is amazing. Butterscotch, caramel, and a hint of coffee. How could I not make a dessert with this? I had some left over wontons and thought of making banana wontons. Then I remembered the Creme Brulee and I decided to go all out and make banana wontons with the bananas cooked in Creme Brulee, Creme Brulee ice cream, and a Creme Brulee syrup. The ice cream itself is simply the perfect ice cream flavor. It's like butterscotch and coffee ice cream combined. Two of my favorite flavors! I even added some butter to the ice cream to highlight the butterscotch. I'll post the ice cream recipe another day when I redo it so I can write it all down. 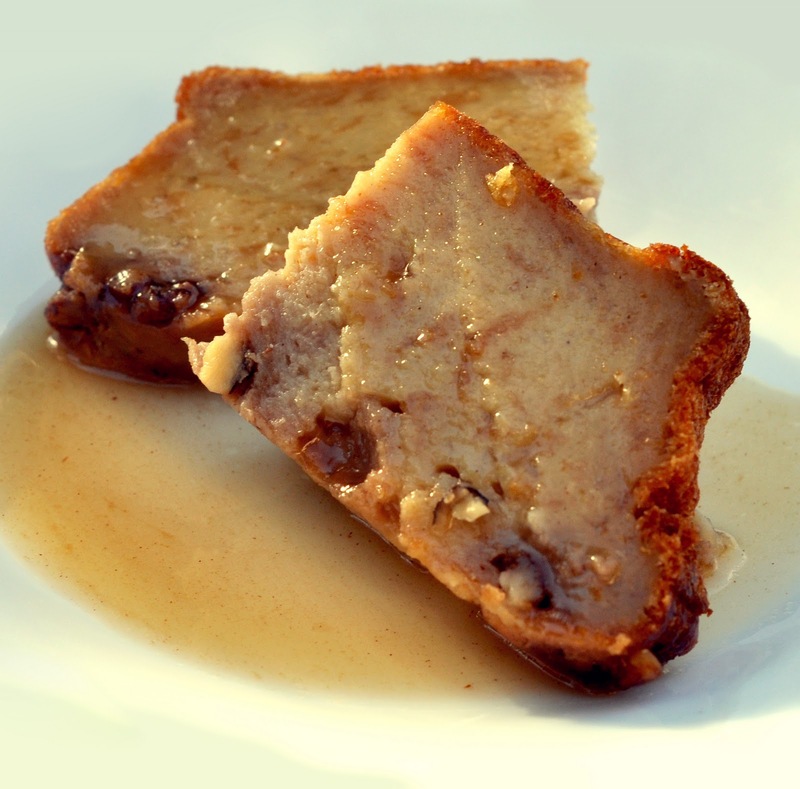 The beer was instantly compatible with the banana, cinnamon, and caramel flavors throughout the dessert. And the syrup... I should keep that on hand at all times. Here's the recipe for the wontons and syrup. For the wontons, melt the butter over medium heat in a small saucepan. Add the rest of the ingredients and cook for about 10 minutes. Fill each wonton with a teaspoon of the filling. Seal the edges with water and pat out any air. Heat a large pan over high heat and fill with enough oil for frying. When the oil is hot, add the wontons. Reduce the heat to medium and cook on both sides until golden brown. For the syrup, combine all ingredients in a small saucepan. Bring to a boil and reduce the heat. Cook until thickened. Crab rangoons are basically wonton wrappers filled with cream cheese, crab, and green onion. I wanted to pair them with a beer and decided to try a pilsner so the clean and crisp flavors could complement the fried wontons. I tried them with both Lagunitas Pils and Victory Prima Pils to see what would work better. Lagunitas Pils is maltier and Prima Pils is hoppier, so they both complemented the dish in different ways. I liked the way Prima Pils' hoppiness and crispness worked between bites of the rangoon. It was not too overpowering but still enough to wake up your mouth. It was more of a contrast to the dish whereas Laguintas Pils kind of melded into the dish because it was less hoppy and a little sweeter. My mom preferred Lagunitas with it and I think I preferred the contrast Prima Pils gave, but they both worked. I'd also be interested in trying a saison, a hefeweizen, or even a sour beer. There's lots of flavors to play off of with the cripsy wonton, cream cheese and crab mixture, and sweet and sour dipping sauce. There's no exact science to pairing, so experiment...that's half the fun! Combine the ingredients for the filling in a large bowl. Place a small amount of the mixture in each wonton wrapper. Fold in half and seal with water. Heat a large pan over high heat and fill with about half an inch of oil. When the oil is hot, add the wontons. Cook for a few minutes on each side until golden brown. Serve with sweet and sour sauce. So the goal of this blog is basically to show that beer can be used for much more than just a beer batter or beer can chicken. It's so versatile and can be used in any part of cooking to enhance flavor or texture. It seems people don't just think of one thing when cooking with wine and there is absolutely no reason that beer can not be used as diversely. I believe that craft beer is classy and can work in many gourmet foods just as well and many times better than wine. And with all the different styles, there are endless amounts of flavors beer can give to food. But I don't have to preach to you guys. You already know all of that (and if you don't, you need to take a look at the rest of my recipes). However, I must admit beer does make a great light and crispy batter so I figured it was time I gave it a try. In a large bowl whisk together the flour, beer, paprika, cayenne, garlic powder, salt, and pepper. I cut my fish into a few pieces and seasoned it with some salt, pepper, and garlic powder. Coat the fish with flour and dip into the batter. Put a large pan over high heat and add about a half inch of oil. When the oil is hot add the fish in batches, cooking for about three or four minutes per side. To assemble the taco put some lettuce on the flour tortilla. Combine the ingredients for the sauce and pour on top of the lettuce. Add a few pieces of fried fish and top with the salsa. My boyfriend asked me to make him a chicken pot pie the other night, so I made a little individual portion. I used a beer to step up the flavors and give it that special tang. I chose a lager because I don't really cook with them that often and we thought the clean flavors and bready characteristics of Weihenstephaner Original might work with the dish. I started out by cooking some onions, garlic, mushrooms, celery, and chicken with a bit of butter (everything cut into chunks). Then I poured in milk, evaporated milk, and some of the beer. To that I added chopped potatoes, carrots, and peas and seasoned everything with salt, pepper, garlic powder, and chicken bouillon. I also included some fresh thyme. I let the vegetables finish cooking and used a little flour to thicken everything up. Then I just transferred the mixture into an oven safe bowl. Mmm chocolate soufflé. It's surprisingly simple to make. The basic idea is just whipping up some egg whites and folding that into a mixture of egg yolks and melted chocolate along with some sugar. The fluffy egg whites are what makes the soufflé puff up in the oven. Before baking, it's already basically chocolate mousse, which you could just eat as is. Baking it gives it a little crunchy exterior and a warm gooey mousse-like center. And what better beer to pair that with than a decadent chocolate and coffee imperial stout? Or better yet, why not add that beer INTO the soufflé? I incorporated Mokah from Southern Tier into the soufflé itself as well as the delicious chocolate topping. The final product of a Mokah chocolate soufflé paired with Mokah is perfect rich and delicious harmony. I also wanted to mention that it's a whole different experience to eat cold. I had some leftovers that I ate after keeping in the fridge for a while and it is just as delicious with a bit of a different texture. And when the topping gets cold and a little more solid it is really good. So even though it deflates a little if you take a while to serve it (the last picture is actually after a few hours of being in the fridge) it will not stop being delicious, and that's what matters. Directions: Prepare the serving glasses or ramekins (make sure they are oven safe) for your soufflé by rubbing the inside of them with butter and then coating that with sugar. Next, melt the chocolate chips. I just do it in the microwave being very careful to mix it every 30 seconds so they will not burn. Beat the egg yolks along with half of the sugar until frothy. Combine the melted chocolate with the egg yolks and add in the vanilla and beer. Beat the egg whites with the rest of the sugar until soft peaks form. Fold the egg whites into the chocolate mixture and then pour into serving containers. Place them in the oven at 350 degrees and bake until they puff up and look a bit dry on the top. While they are baking prepare the topping by melting the butter in a saucepan. Add the milk and bring to a boil. Remove from heat and add in the chocolate, stirring until combined. Then add the sugar and beer. When the soufflés are ready, remove them and dust with powdered sugar. Pour the topping on top or make a hole in your soufflé and pour it in. I made a little four course meal for my boyfriend's birthday. For the first course I made crab cakes since he loves those. For some reason I got the idea to make crab stuffed mushrooms too so I separated half of the crab cake mixture before adding the egg, spices, and mayo. I added butter and cheese instead and stuffed the mushrooms. The crab cakes paired so wonderfully with the Brooklyn Sorachi Ace we were having. Really, you have to try it. The main course was some delicious lamb. I seasoned the lamb chops with mint, thyme, pepper and plenty of salt. I pan seared them and then deglazed the pan with some Allagash Dubbel and made a little sauce with that. I paired the lamb with some tasty thyme and butter potatoes. I really wish I had bought more lamb. We were licking the bones clean. Eek.. poor lamb. So yummy though. For dessert I made a Mokah chocolate souffle. Mokah is a beer from Southern Tier that pretty much tastes like a dessert. Very chocolatey with a little bit of coffee. The souffle turned out great and I will definitely be posting the recipe soon. Brian said it's the best chocolate dessert he's ever had :) And of course pairing it with Mokah was just a perfect flow of chocolatey flavors.